Lately while shopping i've been more into quality over quantity, buying a more expensive item that I know will last. 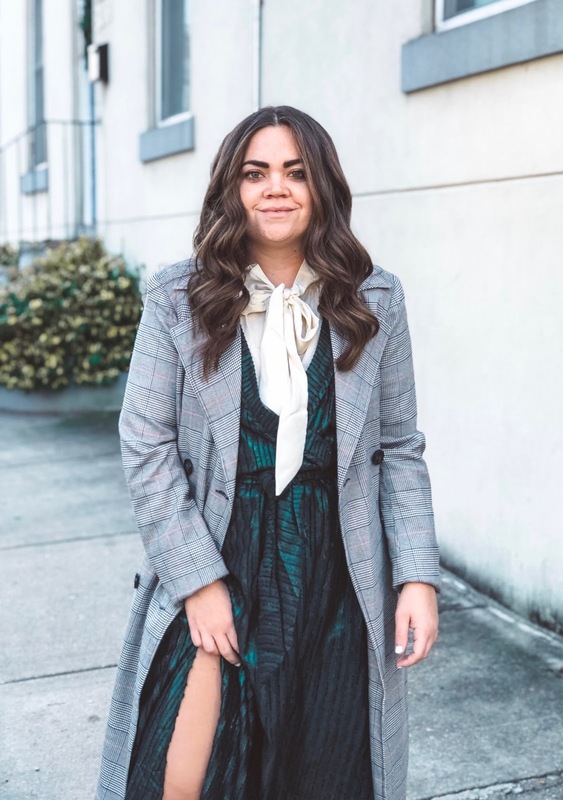 I've been trying to having high quality good pieces in my closet that I know I can also style many ways like this dress! I know its perfect for Christmas time, but also it can be used all winter long for many occasions! Below Im going to show you how to style this beauty three ways! The first way is obviously just by wearing this dress by itself, I'm planning to wear it as my Christmas dress this year! Emerald green is one of my favorite colors around the holidays. The dress is chic enough by itself, but I also decided to throw my leopard faux fur coat over it along with a gold watch! Im planning on wearing this outfit to a Christmas party and a winter wedding!! 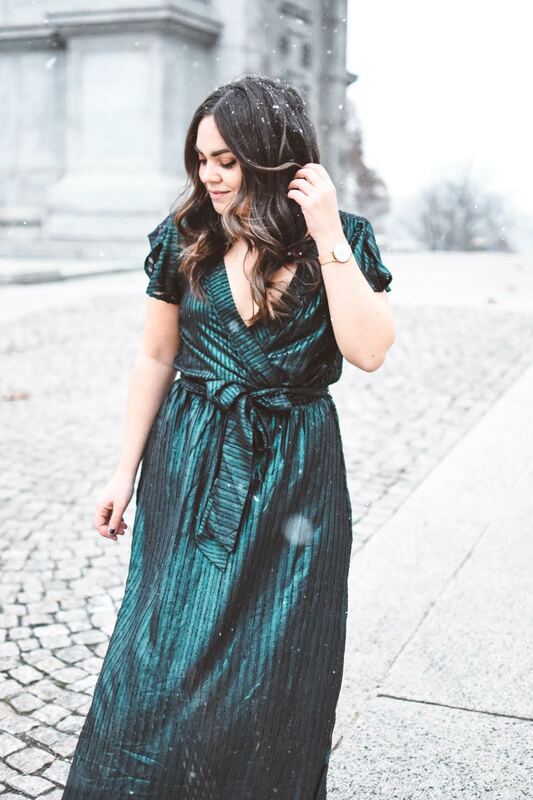 For my second look with this gorgeous emerald dress, I wanted it to be cozy and a tad more casual but still give a winter vibe! Here I threw on a pair of sock boots and a chunky knit cream turtle neck sweater over top! 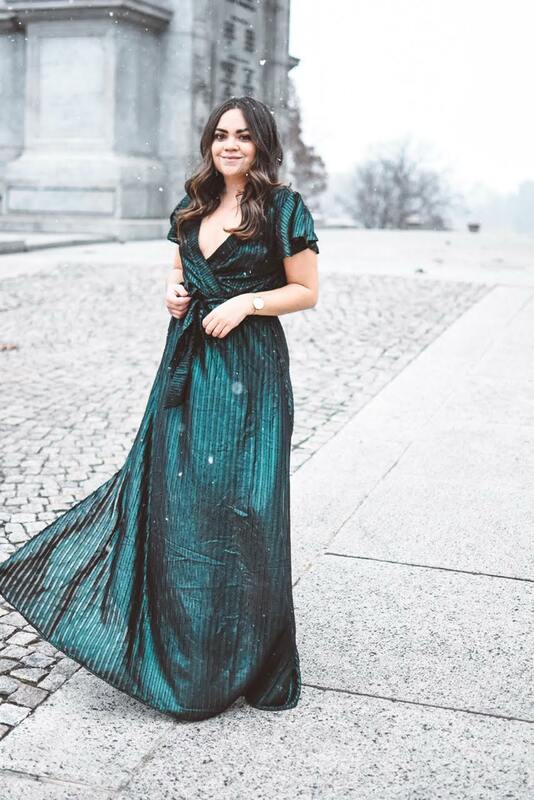 I thought this was perfect for a winter date night, girls night, dinner party or even a night out in your city! The last look I thought Id show how this could be worn from day to night in the sense if even being from work to going out at night! I paired the pleated dress over a white bow blouse and threw on a long plaid blazer styled coat. I wanted it it be more professional and I feel this blouse was perfect for that with the coat! Where is the sweater from?